Your Horse is NOT Your Therapist. There’s a cartoon of a roadside stand with a horse inside. The sign says, “Therapy.” We all smile because we’re reminded of that saying about a horse being cheaper than a therapist. I’m not sure that’s true, but after a day of dealing with traffic, watching the news, or doing the most dangerous job of all–working at a desk–we could all use a remedy. Heading out to lose time at the barn is a miracle cure. My cattle dog, Hero, was a therapy dog. We went to a nursing home, making the rounds of the day room first, and then down the hallway where the very sick or frail had private rooms. I was concerned about what I would do or say, like it even mattered. I feared that Hero would hurt someone inadvertently. Once we were there, all my brain chatter subsided as I watched him go to work. I almost didn’t recognize him as he moved quietly from patient to patient. One night, he crawled over the edge of a man’s bed, careful to not disturb the tubes and bandages, until he was nose-close. He went perfectly still while the old man, as frail as parchment paper, tilted his head to the side, so he was cheek to nose with Hero. There were so many needles and tubes, but in that moment, Hero and the man shared a breath, slow and deep. Who is this dog? After we left, he slept for twelve hours straight–profoundly exhausted. Most of us know enough about therapeutic riding programs to know what amazing things happen there. During the time I volunteered, there was always at least one ride that gave all of us goosebumps. Total transformations were common place–truly miracles. My respect for those horses was immense but at the same time, it wasn’t surprising to those of us with animals at home. Our dogs know when we are sad or sick; our horses routinely seem to read our minds. The success of therapy work is well documented and undeniable, but who speaks for the animals? What do the therapy animals do with all that pain and anxiety they take on? Just because horses and dogs are able to soak up stress and pain, is it fair to sacrifice their mental health for our own? Did you know that most horses in therapeutic programs have fairly short careers there? The work is physically taxing on their muscular-skeletal system as many of the riders have low muscle tone or difficulty balancing, but the work is emotionally draining as well. Did you know that most rescues won’t adopt to therapy programs because of that early burn-out rate, preferring to find a forever home instead? I’m not saying that these programs are abusive but we should never understate the impact the work has on therapy animals. Or the impact our own mental state has on our own animals. Do you have a good, tolerant horse? Most likely he is more stoic than reactive. All horses are sensitive; some show it by being tense and spooky, and some shut down. Those stoic horses get taken for granted sometimes, when the truth is they deserve the same considerations–maybe even more. If a sensitive horse needs a consistent, peaceful rider, then maybe a “good” horse needs it twice as much. Can you judge the stress level of your horse? Does he blow and stretch? Or is his mouth tense? Are there stress lines around his eyes? Does he grind his teeth? Can you tell the difference between a lick-and-chew and tense jaw/bit anxiety? Horses in high stress competitive training are not the only horses at mental risk. As a trainer, I see horses struggle to deal with the stress of their rider all the time. Can you tell the difference between your problems and his? He needs time to process all dimensions of the ride. Positive training means that we get our egos out of the way, but also our insecurities. How we feel about ourselves is the truth behind any attempt at leadership. Our horses will be honest about that, even if we pretend differently. Even if we can’t find the strength. How can we help our horses deal with our stress? Make sure his barn is a peaceful place where he has a social life with other horses who don’t threaten him. He was born to graze, so require free feeding and turnout daily. Most of all, ride happy; breathe and smile. Do it until he blows a relaxed sigh. Discipline your mind to leave the worry elsewhere. And keep that commitment. Everyone has a bad day from time to time and some saddle time is a good way to escape, but sometimes it’s more. Are you mourning a loved one or a lost relationship? Are you a committed rider who’s always been timid, but lately even more so? Maybe it’s a good time to muck the barn and give the saddle a rest. Consciously work to resolve your stress on the ground. If the dark feelings don’t pass in a few days, be proactive. Perhaps the best thing you can do for your horse is to take care of yourself. Depression is a common mental illness with resolution available. If anxiety rules your mind, there’s no shame. Be as honest as a horse and if you are struggling, get some help from a professional–with two legs. Horse people are a tough breed. We don’t like to appear weak. We usually care more about our horses than ourselves. Grow to see that it’s the same thing; that our horse’s welfare is only as good as our own. Horses do make us better humans, but we have to do our part. Horses are therapy animals naturally. We can’t stop their senses and perception–it’s how they’re made. But at the least, we can listen. And when we know better, it’s absolutely our responsibility to do better. I am privileged to have seven horses in my care…..and they are getting so much better care since I started reading this blog – PLEASE don’t ever stop your blog. Since reading it, I have learned that each one of my seven understands so much more than I was aware of. And each one expresses how they feel in much different ways. Stress looks different in each one. Thanks again for bringing the message “home” for me once again!!! Thanks for bringing up things I never would have thought of on my own….. 🙂 or never thought of before now! Can you even imagine how these words lift me? Because I write to pay back a debt I owe my horses. Thanks, and keep up the good listening. You have some very lucky horses. I wish every therapeutic riding center I have volunteered at would read this article. I know people in that world who are profoundly aware of this price paid… and others who trash horses left and right, believing they are expendable. Sigh. Pls adjust your database so I can continue to receive your messages. this strikes a chord for me as I’m now inundated with requests for letters documenting “disability” so college students can have “emotional support animals” in their apartments and dorm rooms — cats, dogs, bunnies, guinea pigs, rats, ducks, sugar gliders, even a tarantula and ball python. It is easy to answer the screening questions correctly to be “diagnosed” with anxiety and depression and no one seems troubled to be labeled as disabled in order to get this accommodation. If I refuse, then I’m discriminating against the disabled. But what of the animal crated up all day in a small poorly ventilated room waiting for its person to return so it can be the treatment plan for all troubles? It is our conceit that animals exist for our pleasure and support. No one has brought a sneakered mini into the dorm yet but the day is coming. That day I better retire so I can get my emotional support watching my ponies cavort in a field and my dogs run off-leash. Jees Louise, Anna. Thank you for this. Years ago, I was heartbroken. I went on the pasture. And the gelding and his body – then not in the habit to come over – walked over to me. One stood on my right side, the other one on the left. They just stood there and waited. That showed me how big a mess I was. They are amazing. My Grandfather horse did it when I needed it, AND I went to lots of therapy. He made me want to be healthier, and this is my thank you, paid ahead. Those pasture moments… nothing better. Thanks, Nadja. I volunteered for a therapeutic riding program for several years. One of the best things they did for the horses was to make sure they were ridden regularly by riders who didn’t need therapy — who would let them gallop and play and even be naughty. Those horses were so careful with the “patients” you could see them holding their breaths. Programs are getting smarter… but Don’t you love that about horses? and then kind of hate it, for their sake? Thanks. Thank you for an excellent article on and important subject. Reminds me a little of the movie “Resurrection” with Ellen Bursten as the woman with healing powers that also took a toll on her. I think about that old movie alot… Thanks for remembering it. I think it’s how horses do it. Do you know of Suzanne Clothier’s work? I think you two are peas in a pod… I really, really, really appreciate your writing. Thank you. I remember reading an article a while ago about search & rescue dogs & how much their work takes out of them. Doesnt surprise me that therapy horses react the same way. And yes, it IS our conceit that animals only exist for us! That attitude is so wrong. Great article! You always make me THINK!!! Thanks, Maggie. Those are special dogs, too. We owe them a lot. Wonderful article. Having worked with therapeutic riding horses in the past, I know that emotional baggage can definitely physically weigh a horse down. Sometimes it’s hard to remember that we work for the horse’s emotional and physical well-being, not the other way around. I have a ritual where I try my best to work out any lingering anxiety and worries of the day through mucking stalls and barn chores BEFORE I fetch my horse. He deserves my highest self. I, too, think mucking retores me to my best.:). Thanks. Thank you, Thank you, Thank you for this post. You validate my long held feelings on this topic. great blog and wonderful comments. Do you know of Dutch Henry. He will go to therapy centers and teach a simple program of exercises to help the horses . Also has a book called Its for the Horses I believe. The exercise are based on Connected Groundwork and are excellent. Not familiar, but most centers do invite trainers in from time to time. Our local group does the very best they can for their horses. I’ll leave Dutch’s contact info up, but without my recommendation. Please understand that I don’t endorse people I don’t know. I am familiar with Linda and Peggy’s work, though–and I have a favorite local TTouch professional. Thanks again. My guy has a super strong self-preservation streak, so I don’t worry too much about abusing his trust with my troubles. His m.o. is humor. Last week as I anticipated hurricane Joaquin’s arrival, on the one dry day in a string of two wet weeks with 15 inches of rain – I was worriedly trimming and applying hoof hardener to stave off the inevitable abscesses. While I bent over his stretched out front leg with the rasp, he smoothly strayed from grooming my back to grabbing and snapping my waistbands – undies + jeans. Quite a delicate feat with those choppers. I dissolved into laughter and he stared at the cookie jar expectantly. Thank you for this great article. My mare is my therapist though! Insofar as she has always, stubbornly reflected back me, to me, and consistently refuses to play a part just to make me feel better! It took me a few years to get it – the hidden tensions, emotional distance, lack of trust, inauthenticity, skin sensitivity; I thought I was just a rubbish trainer until I had several life changing emotional and spiritual experiences that burst me wide open and there she was, calm, joyful, trusting, dancing horse of my dreams, literally overnight. I didn’t realise that we had the oneness all along but it wasn’t until I became my real self that she reflected back what I had always wanted to have with a horse. Interacting at liberty in a big space was always the foundation as we were either in partnership, or she was the other side of the field – simple. Maybe therapy horses would be less burdened if they had more space and choice. Gotta love a smart mare, they call up our very best. Thanks for this comment. Thanks for writing this today. I have a very stoic gelding that came with lots of baggage. Everybody says he is so calm but there are tells if he is stressed. I need to be very aware of not laying my own baggage at his feet. You are right to listen extra closely… The signs are there and you’d hate to take advantage of his tolerance. Sounds like you are doing a good job with him. The flip side of this is how many horses are saved because they are given jobs and have a purpose BECAUSE of their therapy work. In a time when feeding and keeping horses can be a financial and logistical struggle, these animals have been given a way to exist in the human world that does not lead to starvation, slaughter, over-breeding, lack of you use or neglect. In an ideal world all horses everywhere would have their physical, mental and emotional needs are met, however in the reality for which we are actually in…therapy horses have it pretty good. My therapy is the flood of calming brain chemicals I get just walking through the barn door and seeing all those beautiful faces greeting me. Most days that is all I need to leave the stress of the office behind. When it’s not, I learned a long time ago those were the days to find a nice patch of grass and just be near them while they happily munch. I think animal assisted therapy can be great but, as in so many things we do with animals, their full range of needs aren’t taken into account. Few riding therapy programs mix it up for the horses, giving them light hacks in the countryside or gymnastic Dressage work, to help maintain their minds and bodies. They do so much for us, it’s easy to take them for granted. You know those scenes in movies where someone is going skinny dipping and they run, throwing clothes in all directions?? That’s how I go to the barn. Easiest thing in the world to leave the world behind! In a calm, clothed way, and I bet you are the same. Where therapy animals are concerned, we are so new to learning about how the process works and so many times we just get selfish… but they remind us the meaning of reciprocal. One way or another. Thanks for the great comment. Your blogs always make me think. Thank you. Such a thoughtful piece. I have a strict rule that all my emotional baggage gets packed into a metaphorical suitcase and left at the gate. It’s not my mare’s job to fix me. On very rare occasions some grief slips through, and she doesn’t mind that at all. What she cannot bear is stuffed up jangly tension, which I sometimes think I have put in the case and haven’t. She literally shakes her head at me. (She is a thoroughbred and so of course ridiculously, brilliantly intelligent. Or so I insist.) Then I let the whatever is lurking go, and we are all in harmony again. I know horses who work with damaged humans, and the ones who deal with it best are definitely of a grounded and sanguine nature, but they all get constant holidays from the job. It’s such a fascinating subject: thank you for writing about it with such a deft touch. I love this comment… you know grief is a kind of clean, specific emotion, where ‘jangly tension’ is so much more messy. For all of us horses and riders. Congrats on taking the cue, she is a genius TB… and you are smart enough to ride her. thanks. Love this, Anna. Just because our horses are willing to take on our stress doesn’t mean we should keep dumping it on them. I totally never thought of it like this before. But will now–thanks! Thanks, I think that was my point for our horses and dogs. I wonder what would happen to those horses if THEY were entitled to some therapy of their own. 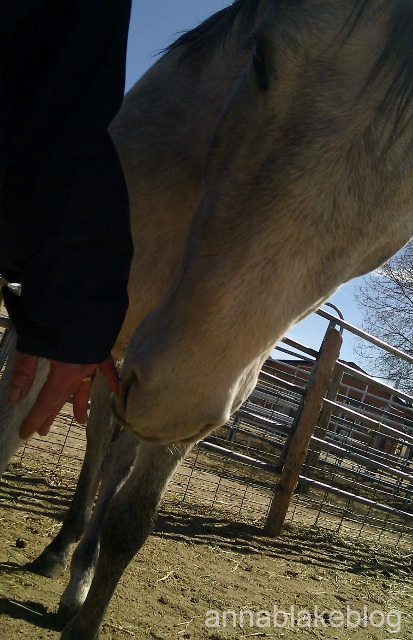 I think of Reiki or other things for the horses to release the stress they take over. Most programs do have give-back therapies… I am also guessing that these programs, being non-profits, probably don’t have all the money they need, past vet, farrier and feed bill, and perhaps donating to them (or volunteering services) would help. Thanks. Great article! Thanks for taking the time to write it. I have a herd of five horses, three of whom are involved with equine facilitate learning (non riding) and I am a strong advocate for supporting therapy horses with regular body work and other modalities that support the physical and emotional state. Equine Bowen, Equine Touch and Equine Raindrop Technique for example all assist with emotional and physical release, realignment and assist to achieve homeostasis. Giving back to horses involved in helping humans is a small but effective way to thank them and enable them to participate for a longer in these activities. Agreed. Giving back is good, and I think we all agree. The challenge is reading and understanding horses, as well as we do humans. I have not met many who manage that. Just to say, it is a huge challenge to do well. Thanks for your comment and good luck with your program. Hi. Interesting your thought that animals “soak up” our distress–I have never found that to be true. They see from within, and beyond it. Unaffected by others’ emotions, I used to be called all kinds of things, but I believe it is one of my autistic threads which remained after I became physically substantial. When physically ill though, natural barriers down, then am prone to absorbing others’ troubles. On the flip-side, believing animals to be so staunch, some people would just use them up…and that is on them for sure. As far as animals being “therapists” I think it out of this world when groups “use” horses as “metaphors” and do a lot of talking therapy around it which they do not call “therapy”…I have each do what comes natural–no words required–that is enough. Thanks for your comments. There are so many definitions of “therapy”… natural is best. It seems some people look at getting help as a weakness, we need to re-look at that and face the fact that it actually shows strength to ask for help when it is needed. Thank you for adding that in as, although our horses and animals do so much for us already, they can’t do it all. Like most things, honest awareness is a really good start. Thanks. Hi Anna, thoughtful post. I’m an EAGALA trained facilitator and err towards the model as it’s all ground based. I am not an equine specialist – more a novice really and the EAGALA model requires a trained equine specialist as well as a mental health professional on the team. The third (equally respected) member of the team is the horse or horses. Recently I was checking out venues for http://www.haloltd.org prior to auditioning potential therapy horses and the horse owner was pleased to tell me she worked with an equine therapist who would ground the horses after our sessions. Also the horses I work with regularly are fed and turned out to their home field after therapy work. My equine specialist has responded to enquirers that after therapy work they relax by just going back to being ‘pure horse.’ After therapy work we usually schedule in rest days for our equine partners. I’m all for the EAGALA model and the partnership required. It’s a growing awareness in your world, and not always as clear in the day to day horse world. For the work they do, for all of us, they deserve the very best care. Thanks for your important comment.